Ole Miss is on the road Thursday night versus Mississippi State in a key conference battle. The Rebels (17-8, 8-4 SEC) and Bulldogs (12-13, 5-7) will be playing one another for the 252nd time, making it the SEC’s most-played rivalry. Following Saturday’s loss to Arkansas, Ole Miss currently sits a half-game behind third place Texas A&M, so the Rebels need a win to keep pace with the Aggies–and it is worth noting that Ole Miss has the tiebreaker over A&M, having beaten them earlier this season. A win won’t come easily, as Ole Miss has not won in Starkville since 2009. But with a victory, the Rebels would sweep the Bulldogs for the first time since 1998. Ole Miss is a tough road team–having won nine of 12 games this season on the road, including wins over No. 23 Creighton, Cincinnati, Florida, Arkansas and Oregon. Ole Miss ranks 37th in the latest Ratings Percxentge Index (RPI) rankings which are released by the NCAA. The Rebels have a record of 3-4 against teams in the RPI top 50, which will be important when it comes time for the NCAA tournament seeding. Mississippi State split its games last week, beating Missouri (77-74) and losing to Alabama (55-51). State is ranked at the very bottom of the conference in turnover margin in SEC play at -3.8. Junior guard Craig Sword leads the Bulldogs in scoring in league play with an average of 12.8 ppg. He is the only player on their team who averages double figures. Their leading rebounder is forward Gavin Ware who ranks 5th in the SEC in rebounds with an average of 8.8 boards per game in conference play. 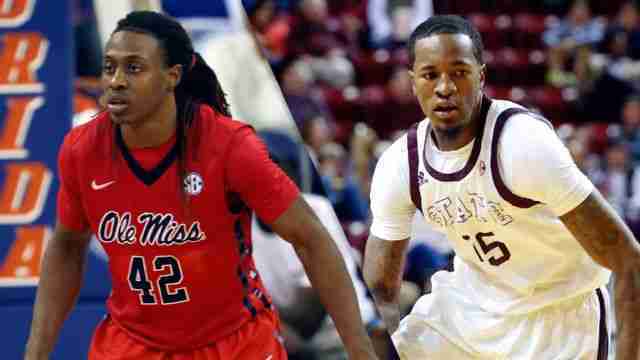 Ole Miss and State will tipoff at 8:00 pm in Starkville at Humphrey Coliseum. The game will be televised on ESPN2 and will also be available on WatchESPN.com. The game will be broadcast on the Ole Miss Radio Network with David Kellum handling the play-by-play duties. Audio can also be found on satelite radio channels Sirius 93 and XM 190, as well as live audio at OleMissSports.com.